Apparently, a lover's aggressive kissing on the neck leading to hickey formation can potentially also cause enough trauma to the underlying carotid artery that it can lead to stroke and even death. Hard to believe that something that normally would cause no more harm than some teasing from friends has potential life consequences. The first published report of a hickey leading to stroke was in 2010. In this case report, a 44 years old woman received a hickey over the right superior sternocleidomastoid muscle which triggered a clot to form in the underlying internal carotid artery. This thrombosis subsequently lead to a stroke which the patient ultimately recovered from with anti-coagulants. It took a few days for stroke symptoms to occur after the hickey. In another report published in the media, a 17 years old teenager ultimately died after getting a hickey over the neck from his 24 years old girlfriend. It is hypothesized that the suction created during an aggressive kiss not only can traumatize the skin causing the hickey, but also can traumatize the underlying carotid artery triggering clot formation which can than break off and cause an ischemic stroke. With any stroke, if massive enough, can also cause death. 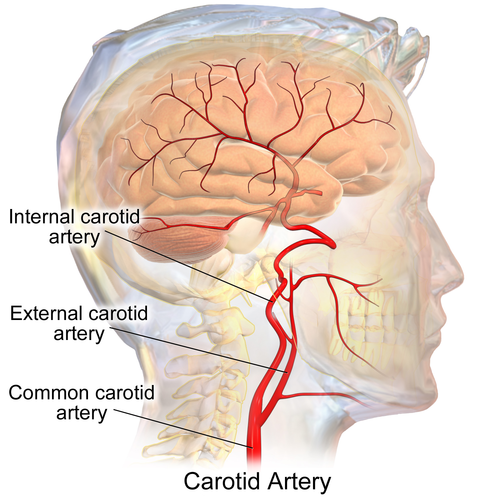 Take a look at the image showing the path of the carotid artery in the neck and its ultimate destination in the brain. This artery is under the sternocleidomastoid muscle that extends from the clavicle to the back of the ear. 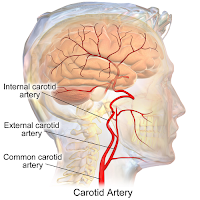 Overall, only 1% of neck trauma from any reason can lead to carotid artery injury with subsequent thrombosis and stroke. First described in 1872, the MOST common cause of blunt carotid artery injury is a motor vehicle action from rapid deceleration with neck hyper-extension/flexion. A hickey can be considered a form a neck trauma and probably is THE most rare subtype of blunt carotid artery injury. After all, there are only TWO published reports of a hickey causing a stroke out of probably trillions of hickeys created over the centuries without any ill effect. So, lovers should rejoice that it IS OK to kiss and if it happens to lead to a hickey, don't go rushing to the emergency room. You'll probably be just fine. BUT, if you suddenly suffer stroke symptoms like a paralyzed limb, DO go to the ER!